3 GREAT HUNTING TIPS !!! 12 Aug 3 GREAT HUNTING TIPS !!! All hunters are suckers for new and creative gadgets, gizmos, and gear that will give them an edge. Here are 3 personal items that I have found helpful, successful, and easy to use. SCENT BOMBS Scent is important for hunters. Deer have an amazing sense of smell. “Deer will hear you 3 times, see you twice, but smell you once!” Scents are used as cover, to mask the human scent, or as an attractant. If you are not paying attention to scent, you are not in the game. Elk hunting is my favorite archery hunt. To get close, you need to know about scent. There is simply no way to beat an elks’ nose. Managing your human scent is a waste of time. Instead, you must manage the wind. If you are smelling the elk, and hunting into the wind, you have a chance. Elk country is rough and tough. 5 minutes of walking and you already stink. Deer can be smelled, if the wind is right, but much deer hunting is done from a stand or blind. Using sprays, washes, and cover scents will help mask the human scent. Fred Bear always said that tree stand hunting gave hunters an unfair advantage. He was more concerned about his scent. Try making a sack full of Scent Bombs. You will need several small plastic sealable containers. In the day, we used 35mm film canisters. I still have a sack full that I break out each season. Punch a hole in the lid and top side of the canister. Slip some heavy mono fishing line through the holes and tie some knots. Now add some hot glue or silicon sealer/adhesive to the knots to hold them in place. Add a couple cotton balls into each container. 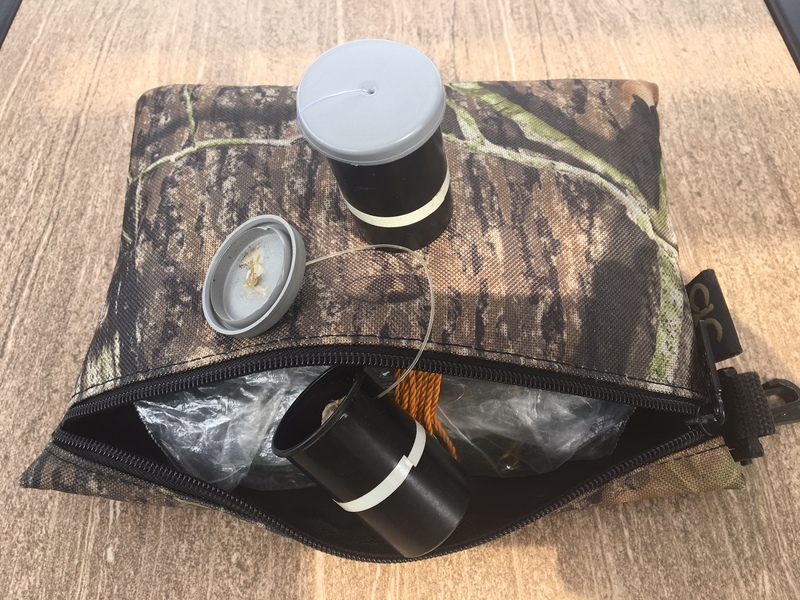 These reusable canisters can bow contain your cover or attractant scents. Place the cover scent bombs around your stand site. Place the attractant scent bombs perpendicular to the wind and your stand site. I usually place them out to 100 yards on each side of my stand. Every 10 yards hang one a couple feet off the ground. I also place one exactly where I anticipate my best shot. The Scent Bombs hang easily between some branches of trees, corn stalks or small bushed. Add some reflective tape around the bomb, so that you can find them with a flashlight. ARROW LOCATORS After the bow shot, you need to find the arrow. You will be able to instantly learn if you hit the target, where you hit the target, and perhaps reuse the shaft again. Arrows tend to pass through the deer if you aim double lung. Will Primos brags, “They will lay down like babies if you double lung the critter!” He is exactly right. If you follow this advice, the critter will fall within 30 yards. If they don’t, you need to locate your arrow. 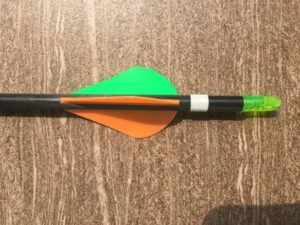 Wrap a ¼ inch wide wrap of reflective tape around the arrow between the nock and fletching. Even when covered in blood, you will find the arrow at night, using a flashlight. Now you know the story. 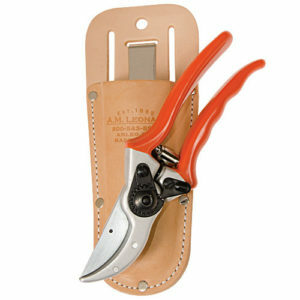 PRUNERS Carry a holster with a good pair of pruners on your pack or gear belt. Mine is right next to my knife so I can quickly remove and use these handy cutters. When I scout early in the season, I prune trails to and from my stand. If you prune a lot, carry the limbs away from your hunting area. You are in the deer’s living room. They know where everything is and what they smell like. I have watched deer smell my morning footsteps t my stand during the late afternoon. If I pruned a fresh limb, they smelled the cut. Cut anything that will touch you as you enter the woods. Avoid leaving scent. Walk in mud, manure, apples, crops or water that is in your area. It is best to prune ahead of the season. When hunting in some remote places, I have found my way from old pruned trails that I made several years earlier. On one occasion, I dropped a buck and realized that I forgot my knife! The pruners did the gutting job just fine. Pruners are also great to carry when fishing or just trekking afield. Use the pruners to cut a limb that grabbed your lure or fly. Create trails to avoid snags or avoid poison plants. Simply throw them into a dishwasher to sanitize. Share these ideas and others with your outdoor friends. A good idea is only as good if it works and others know about it.